This lady from Greenford, Middx, used to wear an upper denture. 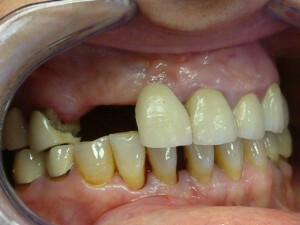 Her existing teeth needed to be removed due to gum disease. 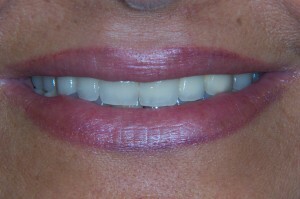 She didn’t want to wear a full denture, so she chose to have a fixed bridge on dental implants. Najla is now delighted with her new beautiful healthy looking, white teeth. This entry was posted in Cosmetic, Dentistry, Implants, Missing Teeth, Reviews on 27 September 2010 by Dr Nishan Dixit.